Earlier in the year the club was invited by the organisers of the Memory Lane Festival in Bundeena. As we were yet to organise a run for November this sounded like a no brainer. Thank you to member Rod Learmonth who helped me by doing a reccy run to see if there was anything we should be aware of and to help choose a suitable meeting point. It’s always good to piggy back on another car show to make it more interesting for members attending and the response was very strong. 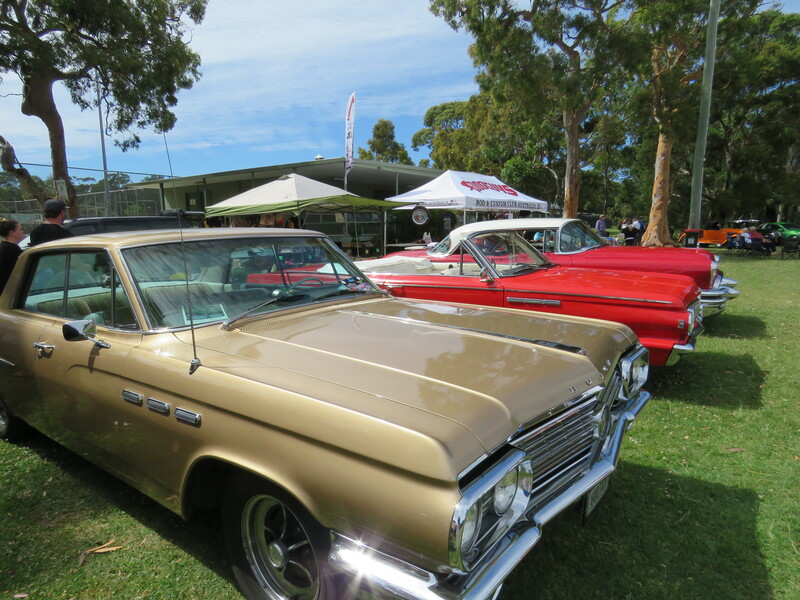 We were not disappointed with the variety of classics, customs and hot rods on display. The Loftus Oval car park was a good spot to meet and proved to be very popular with other motoring enthusiasts on their way south. At 8.30am we made our way into the National Park and had a pleasant 20 minute run, more or less in convoy and in year of manufacture order through the winding roads. We were directed to park on the grassed oval where there were plenty of large trees to shade us from the sun and the weather couldn’t have been better. We set up camp with our tables and chairs and simply enjoyed the company and vista’s of the cars on display. The Bowling Club and toilets were very close by and there were a good variety of food and market stalls not much further away. The coffee was very good and there were a few live bands playing throughout the day. For those that wanted a stronger short black George Fahd brought a thermos and shared his strong mix. Barbara made pumpkin loaf which we shared with everyone at morning tea. It was yummy. It was a relaxing day with lots of opportunity for a chat with fellow members and enthusiasts. At about 1.30pm we were all called over for the raffle draw and trophy presentations. Colin and Dawn Castle won 3rd prize in the Classic section for their 1950 Convertible and the Buick Car Club won Best Represented Club which was quite a pleasant surprise. Mark Laycock won a raffle prize too. Thanks to everyone who attended and helped make it a fun day out. I’ve thanked the organisers and told them we thoroughly enjoyed the day and would be interested in attending next year if they do it again.